Sarah Cooks: Happy Father's Day! I tried to come up with a menu that includes lots of Dad's favourites, but that didn't include any repeats from previous years. (For interest's sake: last year I made Ottolenghi chicken rice with crème caramel for dessert, the year before was jerk pork and a strawberry Swiss roll, in 2010 we took him to Burmese House, and in 2008 I made a roast lamb loin and followed it with a strawberry sponge cake). Even though there were a lot of dishes in this menu, it was relatively easy to put together. I had to make two separate trips to the market (once on the Saturday to buy the meat and vegetables, and again on Sunday morning to buy the oysters), and I made the choux puffs on Saturday night, but actually preparing and cooking everything else on the day itself only took a couple of hours. 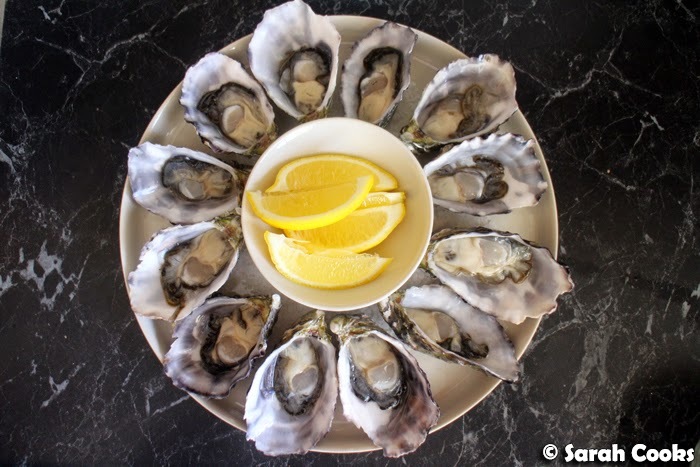 I bought a dozen Coffin Bay oysters from Claringbold's Seafood and they were gorgeous - creamy and fresh and briney. Perfect with just the tiniest squeeze of lemon. 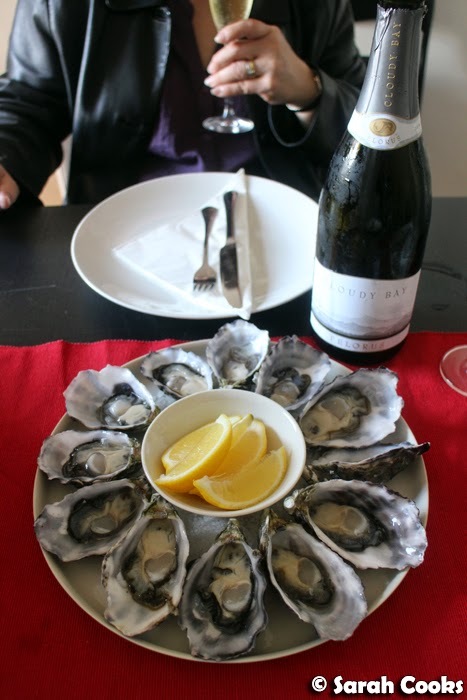 (And a glass of Cloudy Bay Pelorus sparkling brut - Dad's favourite!) Actually, the sparkling wine went well with both the oysters and the pork, with the crispness and acidity of the wine complimenting the oysters, and also cutting through the richness of the pork. The main course was a rolled and boned (heh) loin of free range pork, which we'd bought at Hagen's Organic Meats in Prahran Market. I love that shop! They have so many different cuts of meat, and really knowledgeable service. I wish they were around when I was doing my Sarah Discovers How to Eat project - it would have saved a lot of confused looks at my local butcher and odd substitutions, haha! I haven't cooked many roasts in quite a while, but doing the meat shopping for this lunch really makes me want to revisit some of those epic roasts from How to Eat! I hadn't cooked loin with crackling on before, so I was nervous about it, but it turned out great. Hooray! Super crackling! 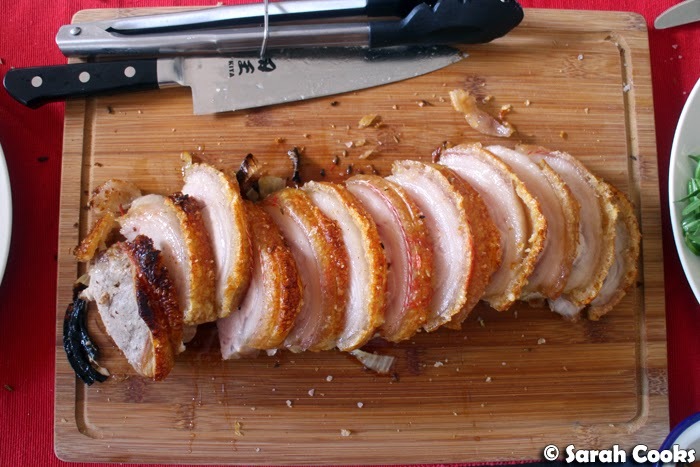 I'll be sharing the recipe for the pork loin soon! I made two baked vegetable dishes to go with the pork - potato dauphinois and roast carrots. Both of these cooked when the pork came out of the oven and was resting, tented in foil, and took approximately thirty minutes. Here are the potatoes! 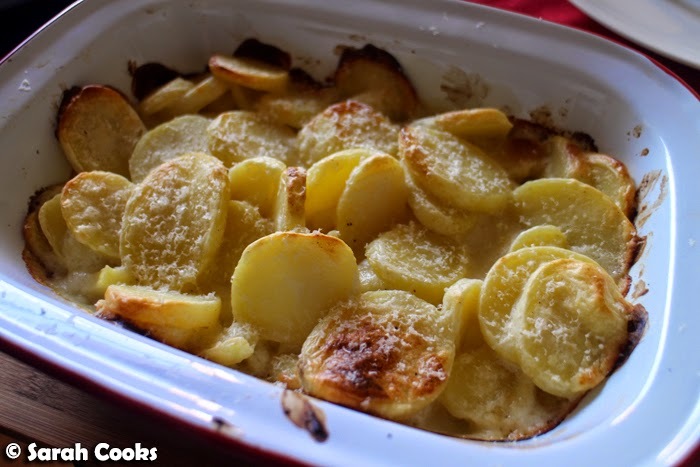 Normally I make Nigella's creamy potato gratin (from Nigella Bites), but I had a packet of Dish'd potato dauphinois with Emmental cheese in the freezer so thought this would be a good chance to use them. Dish'd is a gourmet home delivery service - I attended their launch party last week and received a free voucher to try the service, so these potatoes were a #freebie. They were easy to make (yes, I could have been neater tumbling the frozen potato discs into the dish!) and very tasty - creamy carby cheesy potato goodness. A good option to make a multi-course lunch a bit easier! 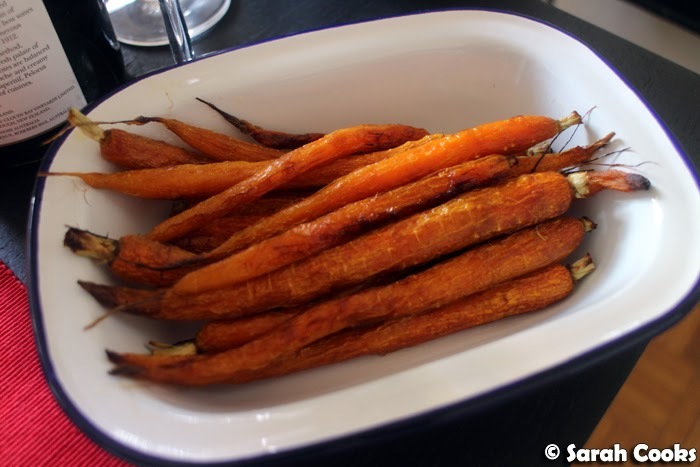 And here we have the roast carrots. I trimmed and scrubbed a bunch of Dutch carrots, then drizzled them with a little garlic-infused olive oil and roasted them until cooked through and lightly browned. And a salad! 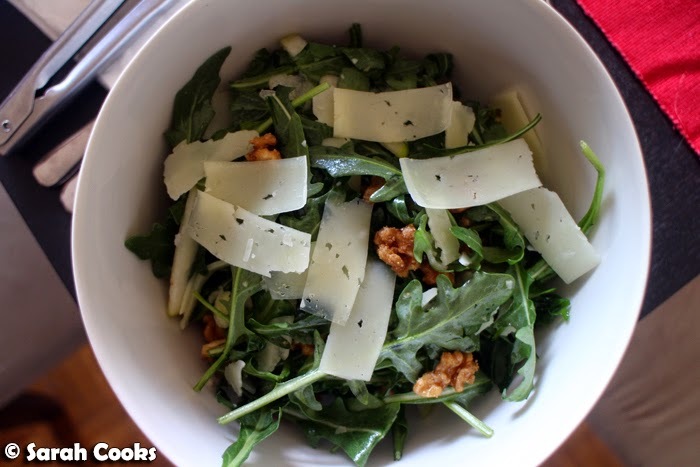 This idea came courtesy of my good friend Lisa in the States - rocket, manchego cheese, sliced pear and caramelised walnuts. The recipe she sent me instructs you to make a caramel and then glaze the walnuts; I took the lazy route of using maple syrup. The salad was great though - the sweet and crunchy walnuts, sweet juicy pear slices, peppery rocket and creamy, almost nutty manchego were a fab combination, and complimented the pork so well! I'll be sharing the full recipe in the coming week. And then... it was time for dessert: profiteroles! 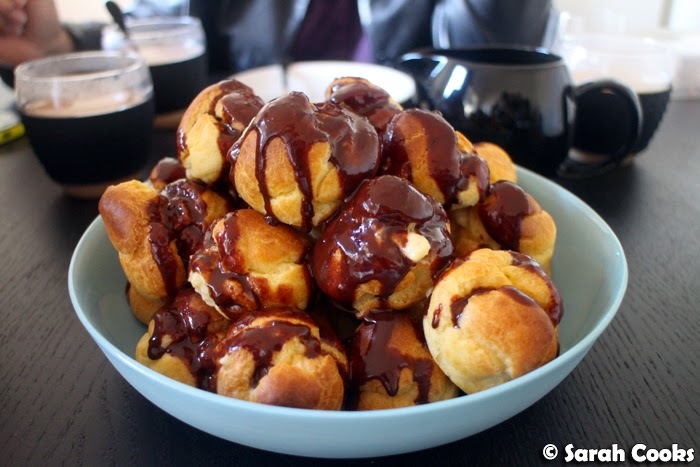 As I said above, I made the choux puffs the night before, and in the morning while the pork was in the oven, I made the crème pâtissière and chocolate espresso sauce. 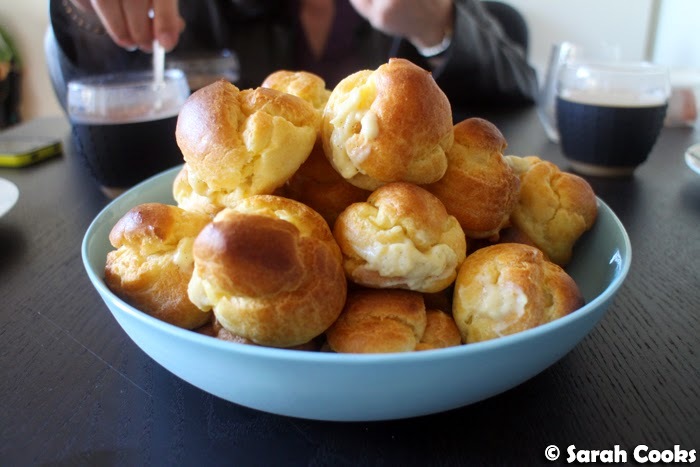 Once we'd finished eating and had cleared the plates away, Sandra made tea while I filled the choux puffs with the crème pâtissière at the table, and piled them into a deep plate. And then we poured the hot chocolate espresso sauce over and it was time to eat! 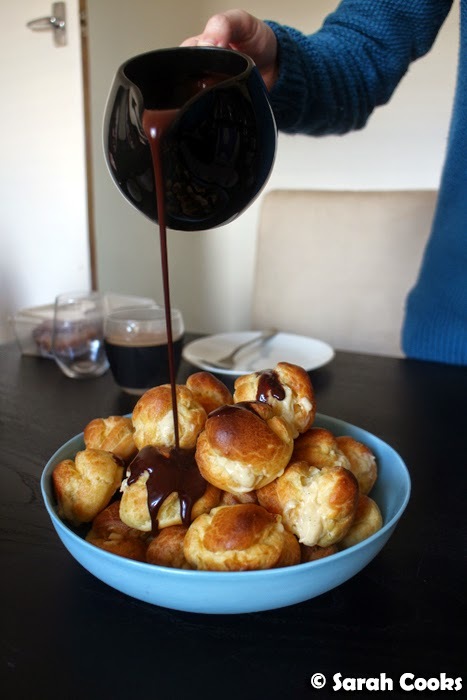 I really like this way of serving profiteroles - it's a very homey, low key way of serving a fancy dessert. They still look impressive, piled up like that, but there's none of the stress of a proper croquembouche. And for anyone who hasn't been reading my blog for that long, please see my series of posts from my Mum's Birthday Party in 2008, where I made a croquembouche as the birthday cake! (There's the croquembouche test-runs, and the finished product). I, of course, added more chocolate sauce to mine on my plate. Yum! 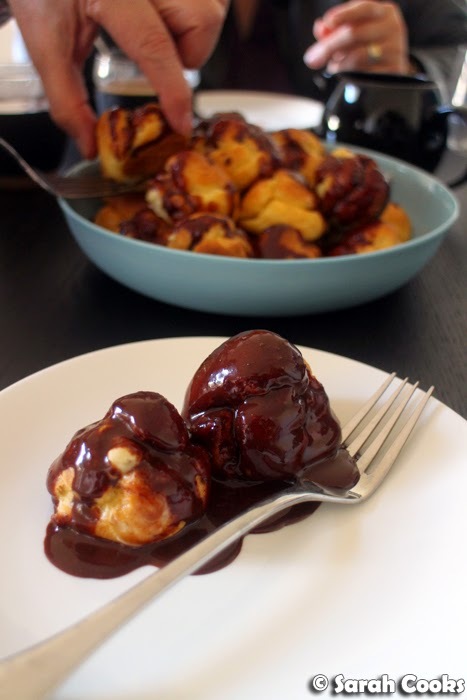 I'll be posting the recipe for the profiteroles later this week - so please keep your eyes out for that, as well as the roast pork loin and the rocket manchego salad! Happy Father's Day to my lovely dad! Haha I did pork as well for Fathers Day but mine was pork belly. 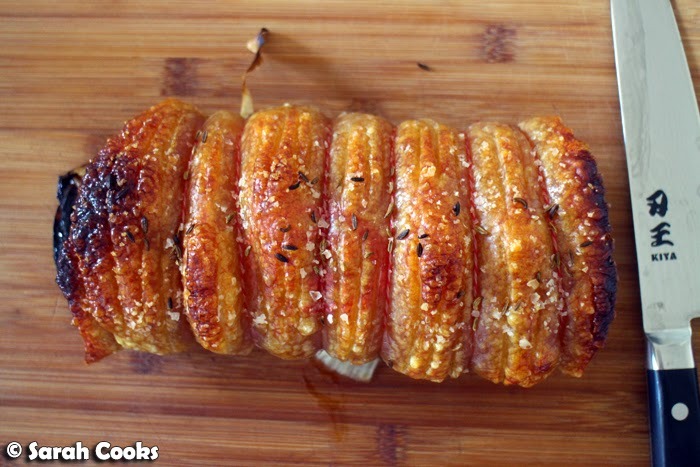 Your crackling looks so perfect! what a festive dishes for father's day!!! Everything looks so good!! I've always loved ur posts on homecooked meals and I can't wait for ur recipes! Happy Father's Day to your dad! I was very very jealous when I saw all your Instagram pics of your delicious meal...I definitely want some of that crackling goodness! And the profiteroles too!